Get Your Equilibrium in Life. Tips on Work-Life Balance. Achieving equilibrium between lifestyle and employment is tricky. 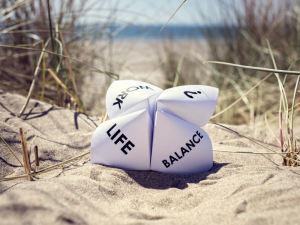 Work-life balance is concerned with how each aspect of your week is prioritized and managed, not only for wellbeing but also the enhancement of both your work and play. Lifestyle can cover anything outside work, including family, friends, hobbies, pleasure and spiritual development and just getting out and about in a social sense. Getting the balance right can make you happier, healthier and more productive in all aspects of your life. Now, perhaps I am guilty of struggling to get this right, like a lot of you. Work demands, deadlines and just those unrelenting standards to achieve, can get in the way of common sense. Balance is the key to happiness and happiness encourages us to succeed. So, as I write this, I am thinking how I can actively focus on creating more equilibrium between what I do and who I am. Why not try too? To get you started here is a checklist to start you thinking about your balance between your job and your life. Find areas that could do with a review! Juggling everything means nothing gets done. Be open about what you need from others, home, friends and family. More to the point, be open with yourself about what you really need. Needs are things that keep us alive and healthy. Wants are things we desire. Try not to confuse the two. Needs are about our relationships and lives. Wants are about our jobs and passions. Respect the boundaries and limitations that others have to maintain their work-life balance. This includes work colleagues and friends and family. Not everyone may want to work as much as you do, and some may like to work so much less. Each of us is allowed to select how we want to find that equilibrium. If your manager says finish at 5, then respect that instruction. If your partner asks you to put away your laptop? Respect their request just as much. Boundaries are moments of definition and clarity. For you and for those around you. What really matters to you? Have you sat down and thought about it? Decide what is important to you and then start to plan how to achieve it. When we become imbalanced in either our work or life, something is over compromised and the outcome is always less than what we desire. Define what you care about and start building towards that, making sure you take a global view on how that goal, job or task will benefit your lifestyle. You have a long life to enjoy and a long career to become successful. Stop rushing everything and jumping ahead of yourself. Take time to breathe, reflect, grow and learn. Slow down and enjoy moments over rushing forward, seeking the next achievement. Let others share in your life and career instead of sprinting ahead of everyone. Sometimes you just can’t get everything done in a day. Or week! Let the pressure to be perfect and those annoying unrelenting standards go. Some things feel urgent but in real life, they can wait until tomorrow. If you can’t get all your work tasks, housework, socialising, and hobbies done in one day, so be it. Prioritize and then reschedule, divert and decide to cut yourself some slack. We can make small things into big things by panicking and ruminating. Reach out for help to get small tasks done and learn the art of delegation. Don’t you just love that colleague who always says yes? Be careful it’s not you! Saying yes to every request and suggestion at work will leave you burnt out, taken for granted and feeling overwhelmed and devalued. Maintain a clear and realistic idea of what you can achieve and achieve well, rather than many half-completed tasks. Don’t set yourself up for failure by saying yes to requests and demands that exceed your job criteria and place you under unnecessary pressure. Talk to your manager and seek strategies on being professionally assertive if you find these hard. Go to my article How to be assertive without upsetting others. What you need to know. if you need to read more on being assertive. I hear a lot about how little time everyone has, but the truth is there is time to be found in every day and in every week. It’s a matter of how you prioritize what you are doing, needing to do and the time you allocate to it. Sometimes you need to make a choice of what is important at home, at work and socially. We spend a lot of wasted minutes and hours which can be used much more effectively if you know how. For tips on managing your time go to my article On Being Time’s Friend. Putting some time aside to relax, think, reflect and do some work on yourself is just as important as doing for others. It can be a few hours a week or a day a month. Find some drop out time where you can just be you and drift or explore your possibilities. Check out my article on self-care and go to What looking after yourself DOESN’T look like. If you need some help here. Like taking on too many tasks that cannot be finished in a day, you need to stop your working day to allow enough time for your life and the people in it. Avoid habits of being ‘on’ all the time. Leave your workplace at a suitable time that lets you be with friends and family. They are just as important as that deadline you’re worrying about. Working overtime all the time can often be interrupted as an inability to get the job done on time. Be mindful of the message you send when you extend your working hours too often and for too long. Hard one this one, I’m the first to admit it! At least 3 days out of 7 (being realistic here!) you need to leave your work and screens on your desk and do something else, notice people around you and work on your non-work identity. The brain needs stimulating and it will get lazy and bored doing the same thing all day every day. Break up your patterns, have a flexible structure to your commitments and adaptive thinking that allows change. In this way, you can challenge the thoughts that you ’must’ do the work when you should and could be doing so many other, equally important, activities. Holidays are meant to be taken. Believe it or not. Plan your breaks and holidays and book them in at the beginning of the year. It gives you something to look forward to, commits time to your friends and family and forces you to take time off and have a bit of balance in your life. It lets everyone know that you will be absent from work. It lets your family and friends know that you value time with them, as much as your commitment to work. Balance is the backbone of a healthy and successful life. It’s never too late to reevaluate how you spend your time at work and in life and start to make changes to create a happier experience in both areas of our lives. On saying that, I’m going to save this and then turn my laptop off and go for a long walk on this sunny, winter day. There’s my equilibrium!